The New Year/New You epidemic has millions of Americans more determined than ever to focus on changing their lives for the better. While over 40% of Americans make annual resolutions, only 8% actually reach any of their goals. Self-improvement goals hold a firm second place right after weight loss for chosen life changes, but so many people lose steam or give up altogether on their resolutions by March. However, some of the easiest changes can occur by simply improving dental hygiene. According to research, 42% of Americans would change or improve their smile if given the opportunity. 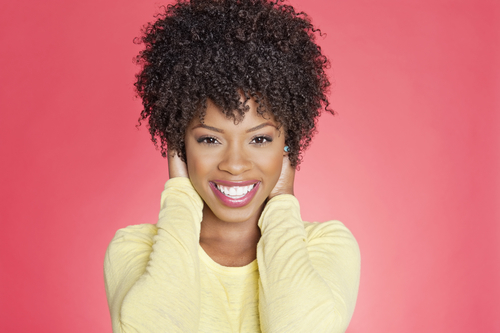 It’s easier than ever to do so by incorporating some effective New Year’s dental resolutions. The beginning of the year is the perfect time to start a new health campaign and finally kick those vices to the curb. Smoking is still the largest preventable source of disease and death in the US, causing almost half a million deaths annually. Many issues can be discovered right in the mouth. In fact, smoking can lead to staining, gum disease, loss of teeth, and even oral cancer. Other common vices such as excess alcohol intake, sugared beverages, and processed food intake can also lead to serious dental and overall health issues. Break the habits and see how your life improves. Your body and mind need certain foods to maintain proper health, and that begins right in the mouth. Good dental health habits can be optimized by eating properly, and there’s a simple trick to that: just opt for more produce over processed foods. The contents within your favorite cans, cartons, and bags may tantalize the taste buds, but they’re also usually loaded with sugar, chemicals, and acids that break down the teeth and encourage bacteria growth. Hard and juicy fruits and vegetable, on the other hand, provide proper nutrition and energy while rinsing away extra food and mouth pests, thus thwarting decay between dental visits. Approximately 30% of Americans don’t brush their teeth twice a day as suggested by the American Dental Association. Yet that’s not always enough since brushing doesn’t remove the food and bacteria lurking in the crevices. Flossing is essential, but 40% of those who do brush twice a day forget that part. Incorporate brushing twice a day and flossing once to keep the nasties at bay between dental visits. Maintain good dental health habits and your body and dentist will thank you. You can limit or ban all vices, improve your diet, and become a dental hygiene warrior… and develop serious oral health issues, anyway. Over half of all Americans suffer from periodontal disease, an advanced form of gum disease that links to multiple bodily diseases. Daily brushing and flossing can help reverse early forms such as gingivitis. But advanced gum disease requires professional care and assistance. Your dentist can also eliminate excess bacteria, recognize early signs of multiple health issues, offer cosmetic or restoration options for a beautiful smile, and help you establish maintainable dental hygiene habits to avoid trouble down the road. What an easy way to start the New Year off with a healthy bang! Dental health is so important to Americans that it’s among the top annual New Year’s resolutions. In fact, according to brand new survey results, 20% of American adults made the resolution to improve their oral health and 15% resolved to go to the dentist more often. Following through with those two goals alone will go a long way toward helping you achieve a beautiful smile. Of course, your dentist may have some tricks up his sleeve to help you get the most out of your dental efforts. But what are some of the best cosmetic dentistry solutions to ensure a new you during the new year? Anyone can walk into a discount or convenience store and grab an over-the-counter tooth whitening kit off the shelf. But at what cost? Regardless of what the claims on the box promise, even the major name kits aren’t a one-size-fits-all solution. In many cases, you’ll need several repeat applications just to start seeing the results you want… if they work for you at all. Even if the concentration of chemicals does whiten a bit, they may also burn sensitive mouth tissue and weaken enamel in the process. That’s not a concern with professional whitening. Custom-created, each patient gets the whitening levels they and their dentist agree upon. And since the procedure is performed by a professional, there’s no guesswork, mess, or disappointment. In fact, your teeth can be lightened up to 10 shades in an hour with the right professional teeth whitening treatment. Professional studies claim that over 178 million Americans are missing at least one tooth. But regardless of whether you’re in that camp, that statistic doesn’t necessarily have to affect your life or prevent you from smiling. Decay, gum disease, and mouth trauma are the main reasons for tooth loss. Sometimes the eventual loss begins as a surface crack or minor chip, but those issues can be fixed easily enough. Even some severe issues can be fixed relatively easily if you get to your dentist early enough. Composite bonding is a strong tooth-colored resin/glass material that is shaped to resemble a natural tooth. A crown is a partial prosthetic tooth that fits right on an existing tooth or implant to replace the missing part. And a bridge works as a prosthetic tooth that replaces a missing tooth or teeth by attaching to existing teeth around the vacant spot. Your dentist can easily decide what is needed and perform the correct procedure so you can get back to smiling. If you want celebrity perfection or to simply have the smile of your dreams as quickly as possible, porcelain veneers may be the solution. Lab created, the wafer-thin porcelain shells are color-matched and custom made to fit the patient’s needs and desires. Two appointments are all it usually takes to get the natural and gorgeous smile you’ve always wanted. 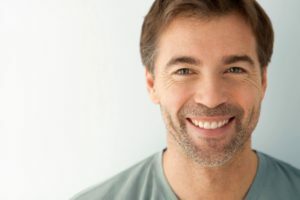 While porcelain veneers are an investment, they generally last at least two decades so they can pay for themselves in the renewed confidence and opportunities a beautiful new smile provides. Give us a call when you’re ready to discuss the best cosmetic dentistry solutions for your new year, new you goals. The new year brings upon thoughts, dreams, and visualizations of a new you for many. And yet, far too many people focus on the wrong goals and wind up ultimately looking back at the end of the year and wondering how so much time slipped through their fingers. The shocking truth is that while 41% of Americans make annual resolutions, only 8% actually reach any of their goals. Approximately 70% of Americans believe making a single change in their appearance can drastically improve their lives. Teeth are the second trait after weight that Americans feel insecure about. So if you’re in that camp, don’t worry. It’s the perfect time to start off the new year with new smile goals. And Invisalign can make it happen. Traditional braces do an amazing job to correct multiple orthodontic issues. But while they’re a rite of passage for most kids, they’re simply not the best option for everyone. It often comes down to the aesthetic value. Two Stanford graduates changed the game by developing Invisalign in 1997, and the procedure was first available in American orthodontist offices two years later. Made specifically as an alternative to metal braces, Invisalign clear aligners fit right over the patient’s teeth. The clear devices allow extra freedom and remove social anxiety associated with metal mouth. And best of all, they can be removed for mealtime, snacking, and cleaning. Invisalign is specifically for minor to moderate dental issues for both teens and adults. So while it may not be feasible for those with severe malocclusion, it can work perfectly for some common orthodontic needs. Gaps or diastema occur when the jawbone experiences abnormal growth in a person’s youth. While most kids have a gap, they usually self-correct during aging. But some gaps are stubborn, prominent, and need correction to improve confidence. Invisalign corrects those concerns just as well as traditional braces in many cases. 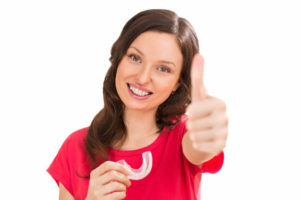 The clear aligners can also correct unattractive and even painful bite issues, including underbites, overbites, and even annoying or embarrassing crossbites. Overcrowded teeth are also a breeze for Invisalign. How Can Invisalign Improve Your Life? In a recent study, over 40% of Americans said they’d change their smile if they had the chance, and over 80% of Americans dislike their smile in pictures. That’s a serious issue today with smartphones and hundreds of social media websites available at the touch of a button. But that anxiety is easily reduced with Invisalign. The clear aligners correct your teeth without drawing extra attention so your smile can shine in social situations. The aligners are practically invisible, so no one has to know you’re wearing them until or unless you feel compelled to tell them. Watch your love life sprout wings as your confidence improves. Invisalign also works well for all types of careers, including those where you’re in the spotlight or have to be visibly active. Your smart orthodontic decisions can positively affect your career as your employer and clients notice the confidence boost and business-friendly self-improvement efforts you’re making this year. Give us a call when you’re ready to start the new year right and get a straighter smile with Invisalign. The new year is born swaddled in the promises of millions of Americans who at least temporarily want to improve their lives. Over 40% of Americans make New Year’s resolutions, yet only 8% actually reach any of their goals. Life and self-improvements are the second most popular resolution category after weight loss and diet goals. A recent study shows that a whopping 81% of Americans think their smiles are unattractive in pictures–an unfortunate and annoying issue in a modern tech-driven world. Fortunately, cosmetic dentistry can help you get the smile of your dreams and check off at least one of your major goals this year. But what are the best resolutions for a healthy smile? Approximately 70% of Americans brush their teeth twice a day as recommended by their dentist and the American Dental Association, but that means 30% don’t. And 23% of Americans have missed at least two consecutive days of brushing over the past year. Even if you have stellar brushing habits that may not be enough if you’re among the 40% of Americans who forget to floss. While brushing twice a day is essential, it doesn’t remove the food particles and plaque between the teeth that encourage and promote bacteria growth. Flossing, however, does. So brush twice and floss once daily to harness better oral health habits. Vices can range from sugar addiction to smoking, and many vices become scrutinized as the new year approaches. According to the CDC, 15% of U.S. adults smoked cigarettes as recently as 2015. That equates to 36.5 Americans with a nicotine habit, almost half of which have a smoking-related disease. Sweet and processed foods, as well as alcohol, contain loads of processed sugar which also lead to disease and chronic conditions. Poor health vices can cause multiple dental issues including gum disease, which is linked to cardiovascular disease, cancer, and diabetes. Get a grip on the vices to take back control over your life. Diets are a dime a dozen but permanent proper nutrition can drastically change your life… and relatively quickly to boot. Processed foods found in bags, cans, and boxes on the grocers’ shelves are chock full of chemicals that the body simply can’t handle. But other more natural foods such as real dairy products, fruits, and vegetables help scrub the teeth between brushings. Hard produce, specifically encourages saliva buildup and enzyme formation which work together to wash away bacteria just waiting to eat away at your teeth and gums. So opt for produce over processed foods to see a huge difference during your next dental appointment. If you haven’t seen your dentist in a while, chances are he misses you. So why not make an appointment today and either discuss the resolutions you’re making to ensure you create good dental health habits. He just might have some cosmetic dentistry suggestions to help speed up your goals and finally have the healthy smile you deserve. Even the slightest dental issues can cause a person to hide their smile. Of course, beauty is subjective and what may seem like a barely visible issue to one person may stand out like a beacon to another. Anything from sudden temperature changes in the mouth to getting hit in the face with a hockey puck can cause a tooth to chip or crack. And they’re not always exclusive. Once a deep crack sets in, the chip is often inevitable. Wait too long to treat it, and the injury can cause extra sensitivity, pain, lower self-esteem, damage tooth pulp, and even require a root canal to repair. But if you act relatively quickly and see your dentist as soon as possible, simple repairs even such as dental bonding or crowns may just save the day and the tooth. But what are the three easiest ways to fix a tooth and how exactly do they work? Bonding is one of the easiest and most affordable dental solutions to repair minor problems. So if the chip is relatively small and uncomplicated, your dentist will likely suggest dental bonding. This is a quick and simple procedure in which your dentist uses a tooth-colored composite material to cover the healthy area of the chipped tooth. They’ll file the enamel slightly and mold the composite to look like a natural extension of the tooth. 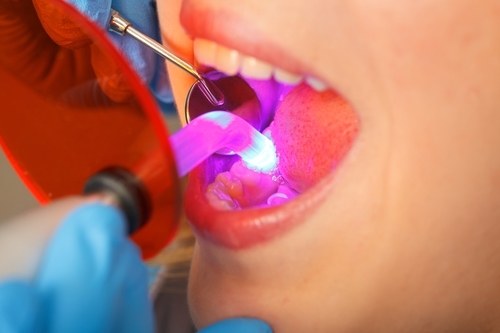 Light rays harden the material, and once it’s applied a professional dental bonding can last a decade or longer without any issues or worries. Larger, more prominent, or otherwise more severe chips that seriously affect your appearance may need the help of porcelain veneers. These wafer-thin porcelain shells are the Hollywood secret for red carpet smiles. But they’re easily adapted to general life needs as well. This procedure takes two to three office visits to achieve, and they are an investment. But if you’ve ever wanted a perfect smile, they’re completely worth it. Your dentist will make molds, color match the porcelain shells to your surrounding teeth, lightly file down the enamel of the tooth or teeth involved, and affix the shells once they’re created. Clinical testing has concluded that porcelain veneers can last up to 20 years without any issues, so they’re a potentially permanent solution for more obvious chips. A dental crown is a tooth-shaped topper or cap that fits over a damaged tooth to correct the damage and restore the strength and structure of the broken or cracked tooth. Dental crowns are suggested for multiple reasons over bonding or veneers. If the tooth in question those surrounding it are especially weak, or the damaged tooth is badly discolored your dentist may heavily suggest a crown. The patient may also request a crown for cosmetic reasons. Crowns are generally applied when the chip is relatively severe, and a significant amount of the tooth is missing. A crown usually requires two visits: one to file the damaged tooth and make the mold, and the second appointment is the fitting once the crown has been completed. Regardless of which option you and your dentist decide upon to correct your chipped tooth, a simple call is the first step to a new beautiful smile. When it comes to New Year resolutions, personal and self-improvement goals come in just after weight loss goals for countless Americans. Over 80% of Americans admit they’d focus on dental repairs if they had the option. While 41% of Americans make resolutions, only 8% ever reach any of their goals. In fact, according to US News, 80% of all resolutions made fail by February. An easy way around that is to enlist cosmetic dentistry to help you achieve at least one goal right off the bat. And if you really want to get a great smile quickly in the New Year, Lumineers may be the perfect solution. Lumineers are a type of porcelain veneer that is about half as thick as traditional veneers. Custom-designed Cerniate porcelain shells are created in widths of around 0.2 millimeters, so a bulky look or feel is never an issue after a brief breaking in period. Digitally created to be strong enough to withstand life demands, Lumineers are more resistant to leakage and cracking than traditional veneers. And since they can last up to two decades with good dental habits, the investment easily pays for itself. Unlike other cosmetic dentistry procedures that take care of one or two issues, Lumineers can correct multiple dental concerns at once. Ditch the whitening strips and head to the dentist. Lumineers all discolored or seriously stained teeth without the addition of harsh chemicals or weakened enamel. Gaps, cracks, and chips can be corrected and covered instantly in exchange for picture perfect replacement “teeth”. You can even avoid the need for implants and partial dentures in some cases as long as your jaw structure and surrounding teeth are in decent condition. Although traditional veneers are still thin compared to other dental solutions, their composite makeup requires a more aggressive approach to ensure they’re properly affixed. As such, irreversible removal of healthy enamel occurs. The process, while painless to most, can cause discomfort and require anesthesia to reduce sensitivity. That’s not usually the case with Lumineers. If your teeth are relatively strong prior to the procedure and you have no serious oral health issues, you may be able to avoid any tooth removal. And unlike porcelain veneers if you’re unhappy with the final outcome or placement Lumineers can be reversed. Lumineers are one of the most efficient cosmetic dentistry procedures that offer almost instant gratification. Two office appointments are all it usually takes to get the smile of your dreams. Lumineers require no surgery or drilling. Minimal alteration of existing teeth is required, and the entire procedure is relatively hassle-free. And since there’s no pain and minimal to no discomfort, painful recovery time compared to other cosmetic dentistry procedures is completely avoided. Before you decide to undergo, your Lumineers transformation, be sure to do your research and choose a certified Lumineers dentist. Give us a call to start your New Year off with a bang and see if Lumineers are right for you. 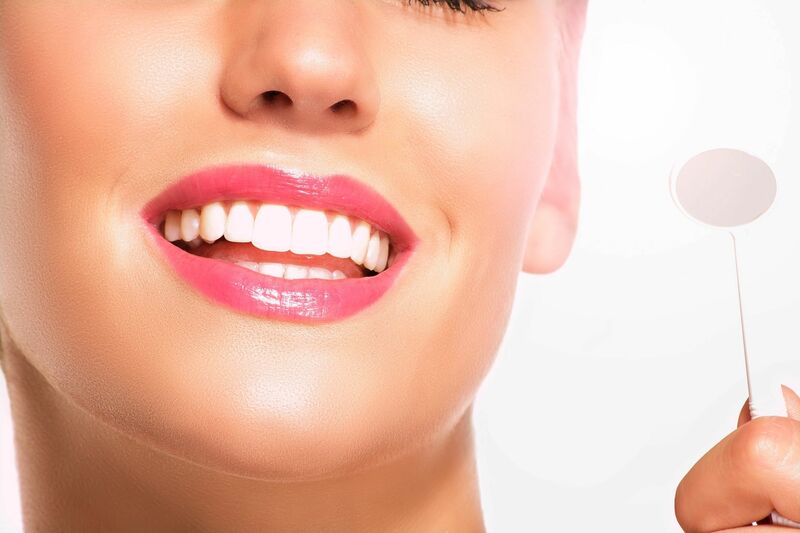 Are You Dreaming of Whiter Teeth for the Holidays? As the holidays approach, many Americans prep and plan, forgetting about an unavoidable part of the season: the inevitable celebration pictures. In this day and age of mobile connection, chances are your image will be displayed on countless social media posts and profiles before you can say “Bah humbug”. According to a major study from the American Association of Orthodontists (AAO), over one-third of Americans are unhappy with their smile and almost 50% of social media users untag themselves from images because of their personal lack of confidence. If only they knew how easily whiter teeth could restore their smiles. 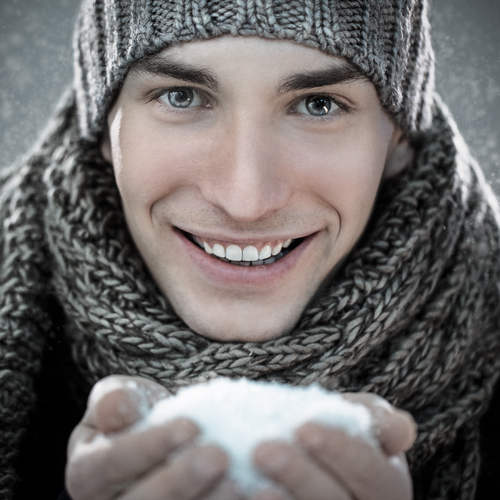 But what are the real benefits of opting for professional teeth whitening this holiday season? Store-based box treatments work in a pinch, but they’re not one-size-fits-all solutions. While some people may experience decent results, others often end up seriously disappointed and repeat the process multiple times hoping to see the change they desire. Of course, that just leads to an empty wallet and potential enamel damage. Professional teeth whitening, on the other hand, is customized to each patient’s needs and personal desires. Each tooth is attended to and the right amount of bleaching and activation agents are used to ensure enough power to whiten and brighten up to ten shades over the store-bought box kits. Over-the-counter whitening products rarely provide dramatic results, so you may need to repeat the process several times to see a difference. That can take months and who has the time for that? The chemicals also often cause irritation and sensitivity that didn’t previously exist. Pro whitening can provide dramatic results after the first visit. Your dentist also knows how to shield your gums and provide optimal comfort so all you have to think about is a beautiful smile. Over-the-counter solutions can actually leave your teeth dingy or patchy. According to the American Academy of Cosmetic Dentistry, however, professional dentists prioritize natural appearances over idealism. So while your favorite celebrity may have translucent or blinding teeth off-screen, your dentist knows precisely how much whitening you’ll actually need to optimize your natural beauty. Cosmetic dentistry results are thorough, whitening all teeth evenly. And the materials are compatible with biomimetic dentistry standards so the procedure is completely safe and worry-free. Over-the-counter kits use weaker solutions than professional whitening options. So you have to use more to see anywhere near the results you want. That can take a long time to achieve, lead to sensitivity issues, and actually discolor or unevenly bleach your enamel. Professional teeth whitening customizes your treatment for your specific needs and desires, thus extending the lifespan of a single whitening. The longer your teeth stay naturally beautiful, the more confidence you’ll experience in the process. Why not schedule your holiday smile makeover session today?